On the crest of the Sierra Nevada in a beautiful sub-alpine setting, Bennettville was once a bustling silver Mining town. In 1881, the Sierra Consolidated Silver Company bought up silver lode claims and founded the town. As with most mining operations of that era, the bust came soon after the boom and ended in 1889. Today, the restored office and a large barn still stand. Visitors can also see the building foundations, the entrance to the Great Sierra Tunnel, Mining equipment, segments of the Great Sierra Wagon Road, and other features. A sign at Bennettville tells about its history, and a monument to the town is located at the nearby Junction Campground. Leaflets about Bennettville are available at the Mono Lake Ranger Station. Both the Park Service, and the Inyo National Forest lead tours through Bennettville. Contact the Mono Lake Ranger Station for dates and times. Bennettville is accessed by two trails, each about 1 mile long. Trail heads are along State Highway 120 just north of the Tioga Pass entrance station at Tioga Lakes and Tioga Junction campsites. State Highway 120 is off the 395, north of Mammoth. 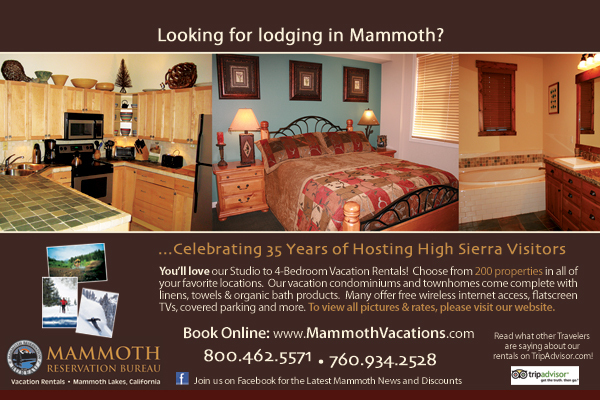 City Concierge is the epicenter of vacation rental reservations, hotels, and guest services for Mammoth Lakes. Offering the most comprehensive list of accommodations for families, group events and weddings.